Home > Basics > What IT Support is Available for Small Businesses? There is an impressive range of IT support available for the small business. With support ranging from the larger IT consulting companies to local, one man IT services, the choices available can at times be confusing. Making sure that your chosen IT firm can meet your requirements is the key to good IT support. A full range of IT support options including onsite and remote help. Consultations and installations of security applications including firewalls, encryption and anti virus solutions. A full range of business IT networking solutions. Fully integrated data back up services including disaster recovery. Full knowledge of computer systems specific to your own company. Computer and software performance monitoring. System upgrades consultations and implementation. Full Internet and email support. 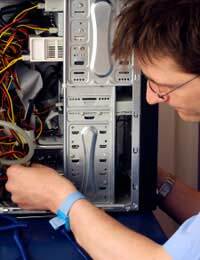 Onsite and emergency It personnel as and when needed. There is no doubt that choosing a small local IT support service will usually provide a more personal touch. Small IT companies have fewer clients than the larger companies and can offer a more personal service. They should also be less expensive than larger IT companies as they have fewer overheads. However, there may be some IT services that cannot be provided by the smaller, one man IT operators such as 24 hour emergency hotline and callout services. When trying to find your ideal IT service the small business should have a list of questions ready. The small business owner should ask questions regarding the IT company's years of experience, experience with dealing with specific systems, response time in an emergency, networking and IT solutions, and of course costing. Different IT companies will provide different pricing methods ranging from yearly to monthly to weekly contracts. There are IT companies that only charge per emergency or support call out. There should always be room for negotiation when it comes to IT support costs, especially with the smaller IT companies. Small businesses do not have an unlimited budget to spend on technology and so the IT support available should ideally be tailored to the budget. This does not mean that small business will miss out on certain IT services. In fact the smaller IT companies may be able to offer a lot more value for money than a lot of the larger IT firms. In most cases the small business will not usually need dedicated onsite support personnel. However if an emergency does occur it is vital that IT staff can attend onsite to fix the problem if it cannot be dealt with remotely. Some small businesses will hire IT personnel on a part time onsite basis with the remainder of the time spent on a call out when needed basis. Small businesses should weigh up whether onsite staff will be needed or whether it will be more cost effective to have IT help when and if needed. As cost is extremely important, small businesses should always ask technology suppliers if they offer any IT support. Communications companies that supply Internet and phone facilities should have their own IT support that will be available to business customers. Likewise technology leasing companies may be able to supply IT support at a discounted rate via IT companies that they use. This type of IT support can help small businesses make great savings on their IT budget. IT support and services for the small business cannot be underestimated. These services do need to be figured into an annual budget and there will be some business tax benefits to be gained. Careful consideration should be taken when deciding on the IT support needed, and choosing a reputable IT company can be the start of a successful long term business relationship.